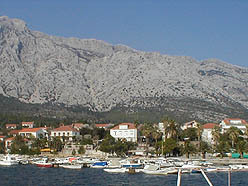 Orebic lies on the foot of St. Elias mountain, highest peak of Peljesac peninsula in county of Dubrovnik - probably the most famous tourist destination in Croatia. Orebic is located on south-western end of Peljesac peninsula - just oposite famous old town of Korcula - thus making the sea view from Orebic even more interesting and beautiful. Orebic can offer you mildest mediterannean climate - average temperaturesof 9.1 °C in january to 26.5 °C during july - enabling you to fully enjoy Orebic long sandy and white pebble beaches and unspoiled nature of surrounding region. Beside diverse coastline, offering different type of beaches, from big sandy and pebble to small rocky and pebble beaches where you can still find some privacy even in mid summer - Orebic hinterground can offer you untouched beauty of St. Ellias mountain (961 m). Bellow it's dramatic looking rocky peaks it offers you calming beauty of Mediterranean vegetation of hundred year old pines, cypress trees, agavas.... Thus Orebic offers you numerous marked hiking and walking paths - diverse in recreational demands, but of same beauty and relaxing qualities. Melted with 'wild' vegetation of St. Elliah hill there is alot of human grown, but not less native plantations of vineyards and olive trees - providing not just a beautiful setting, but also a possibility to experience more of Mediterranean trough smell and taste. Olive oil and specially wines of this region are world famous. Broader region of Orebic is well known wine region, specialy famous for 'Plavac mali' sort - among others Dingac and Postup localties which are well established wine brands. Orebic is well known for it's history of maritime tradition, so it offers numerous hystoric sights and museums. 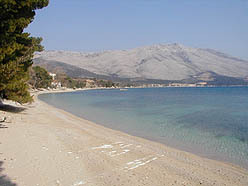 More about Orebic and it's natural and cultural sights on well established portal - Orebic - on Peljesac . info. Orebic also offers you numerous restaurants, caffes and few clubs extending relaxing evening walk on promenade to more fun late night activities... We will try to present most of these on this web site as well. Peljesac offers it's visitors the chance to experience the unique rocky and untouched seabed created by the sea's waves. Diving in Croatia, here you can uncover the hidden and many delights of the underwater world. Because of the open sea and the waves, the shore and seahed are extremely rockyugged which gives a great challenge and memorable moments to all who like scuba diving. We offer all activities connected to scuba diving, regardless if you are a beginner or an advanced scuba diver. Local diving center organize outings to a ship wreck, under sea caves and other sights where you can experience the richness of the undersea world as well as all that the depths of eternal silence have to offer. With their ship, they organize outings around many islands of Peljesac and Korcula archipelago. Also, you can join the diving excursions to the Peljesac-Korcula Canal where you can experience the natural beauty of the numerous islands and rocky cliffs.